Still going where no man has gone before is actor, producer, and writer William Shatner, perhaps best known for portraying iconic space captain James T. Kirk. It appears that Shatner's next, surely not the final, frontier is the realm of melodic progressive space rock. 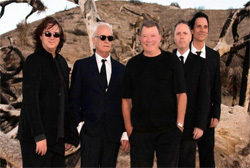 William Shatner: with prog rock group Circa. Frankly, it's a rather interesting, if not awkward, even a little bit creepy, adventure. Shatner works with ubiquitous Cleopatra Records producer Billy Sherwood and a host of international prog talent (see list below) to create Ponder The Mystery. The lyrical concept has something to do with Shatner's 'journey into the mysteries of human curiosity and consciousness.' Well, okay then. The music is generally melodic progressive rock with enough airy and eerie layers of odd synths to call it space rock. With the music you have Shatner speaking his, generally abstract to quirky to nonsensical, lyrics (poetry? see excerpt from Deep Down below), and Billy Sherwood, principally, singing background vocals. And that's where it gets creepy. You're listening to this melodic prog rock, and in my case, in Dangerdog HQ with speakers to the left and right and behind me, and it sounds like Shatner/Kirk is talking to me over my shoulder. When the music goes on for an extended period of time, you easily, absentmindedly, forget that he's there. But then Shatner starts speaking again, and you wonder how he got into the room. Weird. I wouldn't recommend listening to this album on headphones as your brain may freak out. Nevertheless, there are some highpoints to Ponder THe Mystery. Not the least of which is the title track, where Shatner has his most coherent and thought provoking lyrics. Unfortunately, it also has one of the low points of the album: Steve Vai's guitar solo is essentially buried in the arrangement. Another high point is Twilight where Edgar Winter offers a wonderful sax solo. 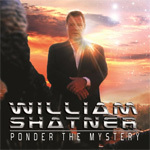 I suspect if you're familiar with and like Nik Turner's brand of melodic progressive space rock you will likely enjoy Shatner's Ponder The Mystery. You can decide if you want to boldly go where he has gone with this album. A part of me needs to be saved, And act a teeny weeny bit brave, And always a little bit afraid, And I haven't said that to you, Cause I'm a teeny weeny bit afraid too, Just a teeny weeny bit afraid too. William Shatner's latest frontier is the realm of spoken word melodic progressive space rock. You can decide if you want to boldly go where he has gone.